Flogr is a great web app that allows you to create a photo blog based on your Flickr entries. You download the application and install it in your web server. The configuration is pretty minimal – point it to your Flickr account and that’s about it. You then have a really nice photo blog set-up ready to be customised. The theme is fully changeable via CSS so the look and feel is totally in your control. The real options are around the photo’s you bring back from Flickr. You can bring all, a set or filter via a tag. I’ve chosen the tag route as it means I can pick photo’s from any of my sets to display. The sites I’ve set-up can be found here. One issue is that the photo’s can take a while to load from Flickr so I intend to set-up a mysql database locally and store the photo’s there instead. You can also view sets and a tag cloud on your Flogr installation and by selecting a photo the metadata and comments from Flickr are displayed. This is the solution I’ve always wanted – photo’s hosted on Flickr but key ones picked up and displayed on a separate blog. Lovely app that’s free to download and enjoy. In this episode the team discuss Google Chrome OS, O2 and Twitter sitting in a tree, Prowl and push notifications and a special look at Plex, a media centre for the Mac. – The software architecture is simple — Google Chrome running within a new windowing system on top of a Linux kernel. For application developers, the web is the platform. – Enterprise push? – http://googleenterprise.blogspot.com/2009/07/paving-road-to-apps-adoption-in-large.html – guess so. – Video assumed – game changer for devices like Flip? – Growl notifications form your Mac pushed to your iphone. In this episode the team discuss the Pirate Bay, iPhone app’s, game news and a bit more on Mobileme. – Talking to the BBC, Pandeya said that he plans to make legal file sharing (which is what The Pirate Bay will be focused on from now on) more attractive than illegal file sharing by paying the users for sharing files. He also plans to pay the content providers that provide the files, and he plans to raise money from the ISPs by reducing their traffic overload. – “Let’s say a popular song comes out. Rather than a million downloads from a site – which would cause a considerable strain on that ISP – we can take that song and put it out on P2P,” he says. – Spokesman for Global Gaming Factory X said they would remove all illegally hosted content – but Pirate Bay has none according to their legal argument, no? – Sounds like Napster 2………but is it bull? PirateBay do like to play games. – GeekTool is a PrefPane (System Preferences module) for Panther or Tiger to show system logs, unix commands output, or images (i.e. from the internet) on your desktop (or even in front of all windows). Use File mode to monitor MacOS X activity with /var/tmp/console.log or /var/log/system.log, or Shell mode to launch custom scripts or commands like “df” to check space left on filesystems, “uptime” to monitor load of your machine… FInally, Image mode helps you monitor bandwith usage, CPU loads, memory availability of your server, via tools like MRTG or RRD. The conversion from Flac to Apple Lossless was extremely quick. In fact it was so quick I thought it had failed but I was wrong – the quality is excellent too. XLD also rip’s CD’s in to a lossless format of your choosing and again it does this pretty quickly. With support for MusicBrainz and also tags in Flac I’ve been impressed with just how flexible the app is. The front end is functional but to be honest that’s all you really need. XLD – a very handy tool to have installed. Dropbox is a brilliant and extremely useful online storage service. Online storage services aren’t anything new and what makes Dropbox special is it’s ease of use, speed and how it seamlessly integrates with your host operating system. Basic account registration is free and you get an instant 2GB storage. Invite your friends and every friend that joins earns you (and your friend) an extra 250MB up to a maximum of 3GB in addition to your initial 2GB. Pro 50 account provides 50GB storage and costs $9.99 per month or $99 annually. Pro 100 account provides 100GB storage at a cost of $19.99 monthly or $199 annually. The service can be used as a simple online storage tool via a web browser, to upload files from one computer and then access those files via a browser from another computer. But Dropbox is much more than that – it can be used to share files/folders with other people, keep your data synchronised between multiple computers and easily create online photo albums. The best way to use it is to install it on your computer, where it seamlessly integrates with Finder/Explorer. Once installed, it can be used just like a regular folder and you can add sub-folders and files to it. When a file is added, it instantly starts to synchronise with the online service, freeing the user to carry on working on other tasks. This is a brilliant tool for users with multiple computers, who want to keep certain data files synched. Store such files in your Dropbox folder and you don’t have to concern yourself with uploading files from one computer and then downloading to another. It all happens automatically without any user intervention. Files added to the special Public sub-folder can be shared with others – just right-click on the file, copy the public URL and send the link to whoever you want to share the file with. If you’re working on a project, create a shared folder for storing documents and invite collaborators to share this folder. Uploaded changes are instantly visible to other project members. As soon as one collaborator modifies the contents of the shared folder, the changes are automatically pushed to other collaborators’ Dropbox folders instantly, brilliant! Accidentally deleted files can be easily recovered. Another really nice feature is that any images added to the special Photos folder are automatically created in to simple photo albums, with public URLs available for sending to friends and families. Have a look at the tour for full details and explanation of the service. There is also a screencast available which clearly shows all the major features. Paper Toss is a simple yet highly addictive game for the iPhone and iPod Touch. The concept revolves around the popular office past-time of chucking a crumpled up paper ball into a waste paper bucket. 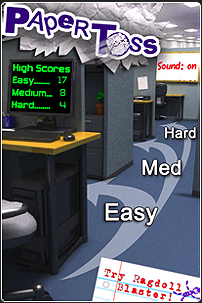 There are 3 difficulty levels with the waste paper bucket placed further on each higher difficulty level. The paper ball will always travel as far as the bucket, so the only thing the player has to be concerned with is the horizontal angle of your .. erm .. toss! Swipe your finger from the bottom of the screen upwards at the desired angle. Sounds simple enough, but extra challenge is provided by a desk fan which varies in it’s fan speed and randomly switches between left and right at each turn. The game is very easy at Easy level, but Medium and Hard levels are quite challenging. Your score can be submitted, along with your location, to an online scoreboard, which can be viewed locally, nationally or globally. For a game that is currently available for free, this is incredibly good and comes recommended. Grab it while it’s still free!